Just as the title says this raw food fast consists of uncooked fruits and vegetables. Whether you choose to eat or drink raw fruits and vegetables this clean eating helps us detoxify. It is a great way to cleanse your body, help the digestive system and improve liver function. 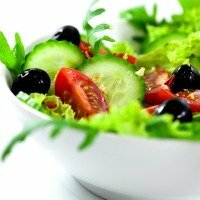 Choose from a plethora of healthy food choices and you are well on your way. Try doing a day of raw foods perhaps one day every other week, or if you are a real health enthusiast do one day every week for even better results. The fast in total is 4 days. Two days to prepare, one day of fasting and one day to come off the fast. With every fast there must be a few days of preparation so you don’t release too many toxins at once. The only thing you will need to purchase is your favorite fresh fruits and vegetables from your local supermarket or farmers market. Choose the foods you enjoy to eat. There are many types of fresh salads you can make, so have fun and get creative. With lunch and dinner include a glass of fresh vegetable juice. Since the size of the stomach and the amount of digestive juices may decrease during a fast, the first meals after should be small and frequent. Avoid consuming milk, meat or heavy foods. You may now start reintroducing certain foods into your diet again, such as fish, meat, legumes, whole grains, nuts and seeds.